The EWU Aqau greywater recycling treats greywater by membranes blowing air through the water allowing micro-biological action to cleanse the water.The membrane filtration ensures the safe and full retention of dirt particles with a filter pore size of 0.00005 mm. The filter module has 30 filter plates and can thus hold back bacteria with a size of 0.001 mm from entering the membrane. The membrane filter module is situated in the casing for an optimal ventilation and an easy access for removing it from the treatment tank. Including a potable water back up connection to ensure a supply if there is not enough clear water is available. Water treatment capacity of 500 litres per day. An iDiver immersion pressure pump is integrated into the service water tank to also ensure a safe supply of water to the points of consumption. 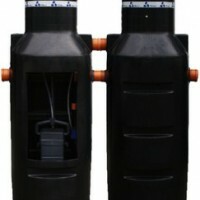 The pump is equipped with an automatic control and a dry-run protection. The immersion pressure pump runs very quietly. Water treatment up to 500 liters per day. Including drinking water feed to other services in case of water shortage. Including automatic pressure-increasing pump in clean water tank for safe supply of the plant with process water.